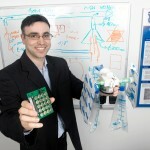 Prof. Hossam Haick of the Technion and the SniffPhone rapid medical diagnostics project have been selected for the 2015 Nominet Trust 100 list. In previous years, this list, which covers the most important digital developments from a social perspective, included Google, Bitcoin, Addex and Coursera. Prof. Hossam Haick and the SniffPhone project – innovative technology for rapid and noninvasive medical diagnostics led by Prof. Haick – have been selected for the Nominet Trust 100 list, which includes the 100 digital developments that had the greatest effect on society in 2015. This list honors individuals and organizations for digital technologies that contribute to society. 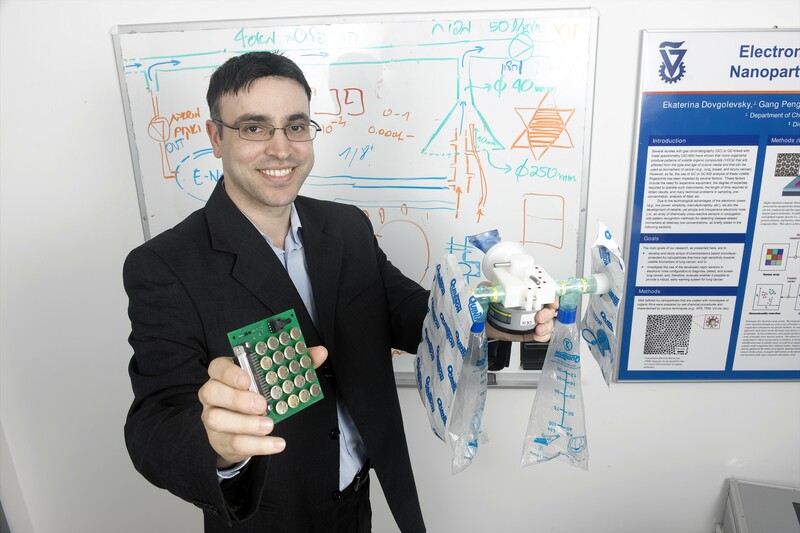 The SniffPhone system is currently being developed by a team led by Prof. Haick, a faculty member of the Faculty of Chemical Engineering and the Russell Berrie Nanotechnology Institute at the Technion. This is a smartphone-linked technology aimed at rapid diagnosis of cancer and other diseases based on the subject’s exhaled breath. This system, which will be simple to operate and not prevent the user from functioning normally, will be equipped with minute sensor arrays that will “read” the exhaled breath. The data will be sent by the mobile phone to a data processing system which will interpret the data and determine whether the subject has the disease. If the answer is positive, it will provide the attending physician with further details using an advanced digital system. Prof. Haick is a full professor at the Technion and an expert in the field of nanotechnology and noninvasive disease diagnosis. He has received numerous prestigious awards and grants, including the Marie Curie Excellence Award, the European Research Council grant and grants from the Bill & Melinda Gates Foundation. In addition, Prof. Haick heads the three European consortia (LCAOS, Volgacore and SniffPhone), each comprising around ten universities and companies. Prof. Haick has received numerous awards and honors, including MIT’s List of the World’s Top 35 Young Scientists, the Knight of the Order of Academic Palms (conferred by the French Government), the Hershel Rich Award (Technion), the Humboldt Award (Germany), the Tenne Prize for Excellence in the Science of Nanotechnology, the Harvey Prize for Applied Science and around 52 other awards and honors. He was selected for the following lists: 50 Sharpest Minds in Israel, Four Saluted Israeli Scientists, Ten Most Promising Young Israeli Scientists and more. He also received the highest teaching award granted by the Technion – the Yanai Prize for Academic Excellence. In 2014, on the initiative of the President of the Technion and with the pedagogical assistance of Assistant Prof. Miri Barak, Prof. Haick led a massive open online course (MOOC) on nanotechnology and nano-sensors, for which over 70,000 people registered.